Ten years ago, state health department staff managing large sets of data collected from Alaska adults and teenagers realized that information generated from these data wasn’t being shared as broadly as it should be. The information was largely in the form of fact sheets and reports that focused only on a small set of questions, with limited comparison among different regions or characteristics. If someone wanted to look at the health data in a different way – see if adults living in one community had higher smoking rates than adults living in other parts of Alaska, for example – they would need to contact a data analyst to do a special study of the numbers. The Section of Chronic Disease Prevention and Health Promotion started to develop a better way to help Alaskans look at the data in hundreds of different variations — depending on what they needed to know. They could do this analysis alone — without needing to contact a data analyst — by going to a new website, typing in the variables they wanted to study, and then let the computer program do the analysis for them and report the findings. 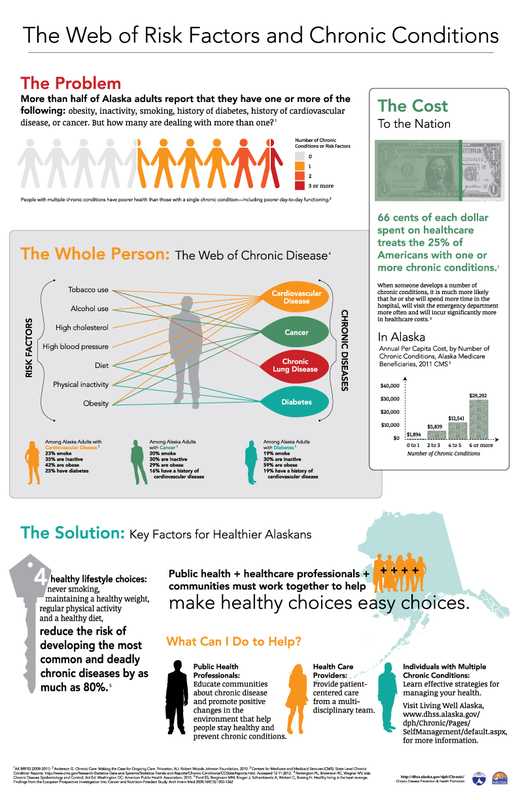 The free web resource is called the Alaska Indicator-Based Information System for Public Health, or simply AK-IBIS. Creating this website was part of the Section’s Informed Alaskans Initiative to improve access to data that can inform public health programs, services, and policies at the state and local level. The Section adopted AK-IBIS from the Utah Department of Health as a low-cost web tool that could summarize results from several health surveys conducted in Alaska. Two of those surveys include the annual Behavioral Risk Factor Survey System (BRFSS), which studies health-related behaviors of Alaska adults annually, and the Youth Risk Behavior Survey (YRBS), which studies health and social behaviors of Alaska high school students every other year. The Section was able to make great strides in increasing the availability of health data by using an off-the-shelf software program called GeoWise InstantAtlasTM. This software helps users visualize the data they are interested in studying. They can see it in maps, charts, or tables. InstantAtlas was acquired to provide immediate public access to the bulk of BRFSS data. AK-IBIS improves that access through Indicator Reports, which provide a brief report on one health topic, and Query Modules, which allow Internet users to run a real-time analysis that’s tailored to their specific data needs. In the summer of 2012, the Section shared its first release of BRFSS data focused on health behaviors of Alaska adults using the new InstantAtlas software. People interested in the BRFSS data could now look at 132 different variables — from arthritis to mammograms to vision testing — collected over the 20 years of surveys between 1991 and 2010. 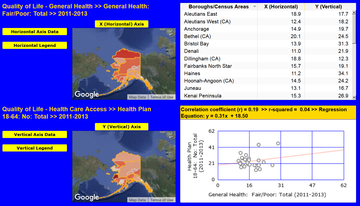 The computer program shared data for Alaska adults in four regional depictions of Alaska: public health regions, metropolitan statistical areas, boroughs/census areas, and tribal health organization regions. People could now look at the data in many ways, instead of just reading about it in published reports that only looked at it in set ways. Since 2012, data analysts with the Section have expanded the number of available variables coming from the BRFSS to 366. To make analysis easier, these variables have been grouped into 47 health topics or themes — such as chronic disease (e.g., arthritis), prevention (e.g., cancer screening), and risk factors (e.g., tobacco use). In order to be responsive to the information needs for the general population and the Alaska Native health system, data are presented for the two predominant races of white and Alaska Native residents, as well all Alaskans within each geographic depiction. The Section now uses its InstantAtlasTM software to share results from BRFSS; YRBS; the Student Weight Status Surveillance System (SWSSS) that tracks healthy weight, underweight, overweight, and obesity in a number of Alaska schools districts; Infectious Diseases from mandated Conditions Reportable to Public Health in Alaska; and the sexually transmitted diseases of chlamydia and gonorrhea. AK-IBIS was launched in December 2013 with Indicator Reports to facilitate tracking of the 25 leading health priorities for Alaska identified through the publicly driven Healthy Alaskans 2020 process. The targeted health-related goals for Healthy Alaskans now appear with every table and figure for each leading health indicator. Although the targets were set only at the statewide level, numerous demographic and socioeconomic breakdowns (such as age, gender, race, ethnicity, marital status, education, income, and poverty) are integrated into the reports to make it easier to assess health equity. Regional depictions of current prevalence of the leading health indicators allow local communities to gauge the impact of their local interventions. The Section of Chronic Disease Prevention and Health Promotion is continuously trying to improve AK-IBIS by adding more sources of public health data, adding new variables to study, and adding more ways the data can be analyzed. This month, the Informed Alaskans Initiative will be enhanced with the availability of data on Adverse Childhood Experiences in AK-IBIS, bringing the number of Indicator Reports up to 75. Updates to the BRFSS (1991-2014) and YRBS (1995-2015) data in InstantAtlas will be incorporated in the coming weeks. The Pregnancy Risk Assessment Monitoring System (PRAMS) query module is also online. Together these public health data sources will inform the decision-making of individuals and policymakers in working toward the health department’s mission to promote and protect the health and well-being of Alaskans. Software and training related to AK-IBIS and InstantAtlas are available from IBIS@Alaska.gov. If you would like to be notified of enhancements to the Informed Alaskans Initiative, you can sign up here for timely, direct notification. Priorities. State of Alaska Department of Health & Social Services website. Access 4/25/2016. Alaska DHSS Commissioner, Valerie Davidson, will be the keynote speaker.